Whether you plan to enhance just part of your garden or transform the whole area we can tailor our garden design service to suit your requirements. 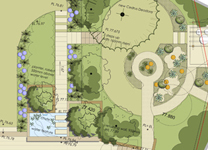 The garden design process is very flexible, therefore our garden design service is too. It begins with a Consultancy Visit where we spend time with you in the garden to help decide if you need a full detailed plan or whether some simple sketches will suffice. After this initial consultation the design process usually follows several distinct logical phases as outlined below although some steps could be missed depending on the size of the project. The importance of establishing a good working brief is essential. Clients are asked to outline their requirements, preferences and budget requirements in a simple questionnaire. This is used to trigger further discussion and develop ideas so that a comprehensive brief is agreed before any detailed design takes place. 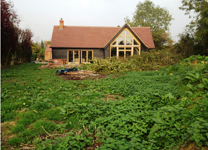 Download our garden design questionnaire. 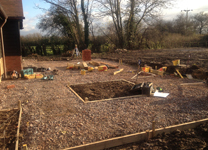 Before commencing with the design, the site is surveyed to record existing features and conditions. This may be a simple measurement survey by your designer or a full topographical survey depending on the project. A meeting after production of this plan is normally arranged so that we can communicate and develop the ideas in person and for the client to identify any preferences. Following approval of any modifications to the Concept plans, a more detailed master plan is produced with relevant annotation as required. In many cases this is a suitable plan to calculate potential installation costs and to build from. Click to view example Master Plan. A real benefit of us designing and building your garden is that your designated garden designer will be committed to you and your project for its entirety at no extra cost, liaising with you and our build team to oversee the work and ensure plans are implemented correctly. If a full garden design isn’t required we can also renovate /update your garden or areas of tired planting with our planting redesign service. Gardens can be rejuvenated using new plant varieties and styles, or simply refreshed with reliable classic combinations. To help you visualise your new garden, 3D landscape models or perspective views of your garden from different angles can be created using Vectorworks if required. Click to view example Perspective View. Taking into account individual preferences, site conditions and the overall ‘style’ of the design, planting plans can be produced to identify the location, number and species of existing and new plants. These will often be presented in conjunction with mood boards and a plant schedule for pricing and many of the plants can be viewed at our nursery. Click to view an example Planting Plan. When required, detailed construction drawings of specific features, lighting or irrigation plans can be produced. Written specification documents that detail the full scope of the work can also be provided and we can arrange structural engineers where necessary. Where required we can also assist with any of the above as ad hoc projects. These are usually charged for on an hourly basis agreed in advance. Of course, if we have designed and then build your garden, your designated garden designer will be committed to you and your project for its entirety at no extra cost, liaising with you and our build team to oversee the work and ensure plans are implemented correctly. Fees for design will depend on the amount of time needed to produce each stage of the process that may be required below. Our quotation will set this out in detail and factor in location and travel time. Where the extent of design time cannot be established at the start of the process we will agree a suitable allocation of time for each stage in advance.